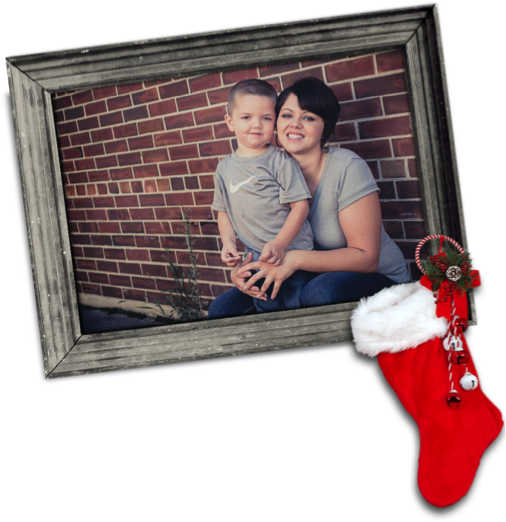 This Christmas  will be very special for my son, Daimon, and me. My home on Pasture Lane will be finished, thanks to the many volunteers, donors, and staff members at Habitat for Humanity. Daimon and I have plans to put up a real tree, decorated with strings of popcorn, and invite friends and family to dinner in our new home. I love to cook, and the best part of cooking for the holidays are the leftovers I can enjoy for days afterward! My favorite part of the Christmas season is that it brings together so many giving and caring people. There are food and toy drives, and people adopting families who can use a little help. The holiday season seems to be a time when people forget their own problems for awhile and look for opportunities to help others. I think Christmas truly brings out the best in people. I’ve seen this same sort of kindness and care from the people I met this year at Habitat for Humanity. I’ve seen people and organizations give generously to Habitat in order to help families they may never meet. I’ve watched people come on their days off from work to help fix up the home I will soon purchase. The kindness of these people I met through Habitat is inspiring and it encourages me as I work to achieve my dream of homeownership. I know when Daimon and I sit down to Christmas dinner with our family and friends in our new home, we will be overwhelmed with thankfulness for all who have had a part in making this blessing possible for our family. I hope you will consider blessing another family like mine through a gift to Muncie Habitat for Humanity this holiday season. May the joy of giving bless you in return this holiday season! Happy Holidays!